WARNING !!! Use once, and you will never raise another litter without this product !!!! The above photo is after 36 hours. I was able to sit in the whelping box and be dry. I had no idea until I lifted the fleece, (photo above), how much pee had wicked through. Whelping box, Fleece, Pups and mom were dry. Breeders will leave this for a week without changing ! 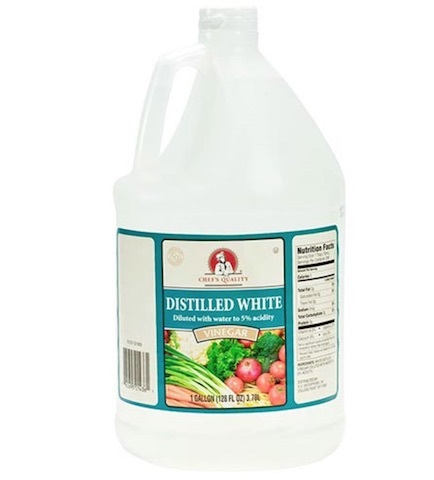 I have used this product for several litters now, and I can honestly say it was worth every penny. I was changing out incontinent pads every 2-4 hours and doing a TON of laundry. The pads would just get so wet with pee and or milk from mom. My mothers were also fussy, pushing wet pads and puppies away. I have had pups get caught up in blankets and mother laying on them, so those didn't work. I can put Vet Fleece down, and know that they are safe, dry, warm, content and quiet. I change it every other day, week 2 until they go home. I would suggest people buy at least "2" pads to have one while you launder the other. 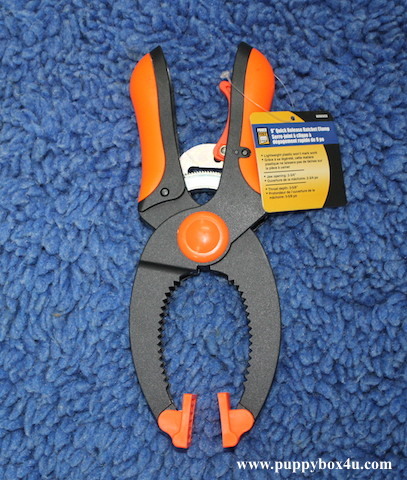 It is VERY heavy when wet and can be difficult to wash in a normal washing machine. I bring home, hang to dry to extend the life of the fleece instead of the dryer. 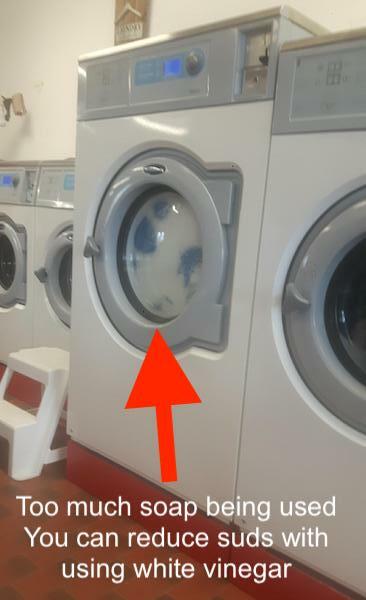 If you dry it at the laundry mat it will take 45 minutes to dry. 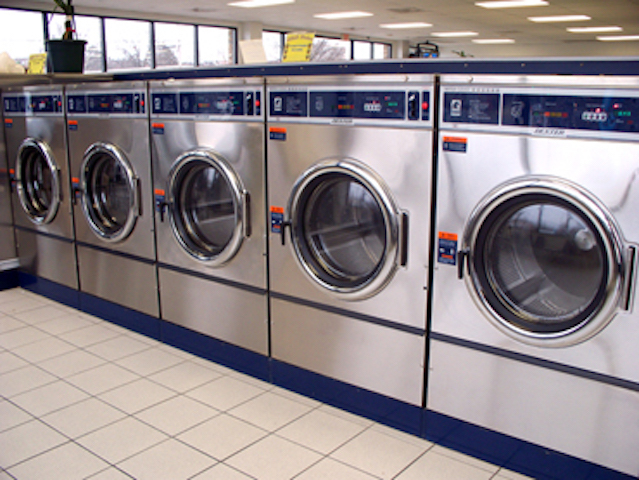 If you use the dryer, Fleece distributors say, not to use liquid fabric softener. 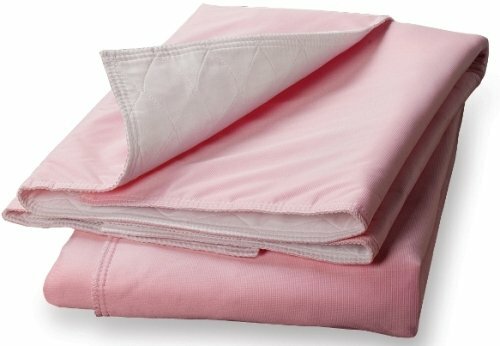 blocks moisture from going through, and prevents the fleece from doing it's job. You can use dryer "sheets" in the dryer if you must, but better if you don't. as well and works to eliminate static. Or having my nice vet fleece, stained with the mess of whelping ! 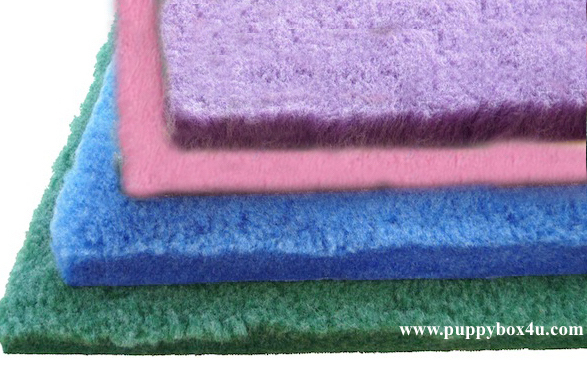 My puppy pads are ideal for the mess of whelping as they are easily washed. Most importantly, it stays DRY, wicking moisture through it. It is said to also keep pups warm with it's insulating properties and be antibacterial. 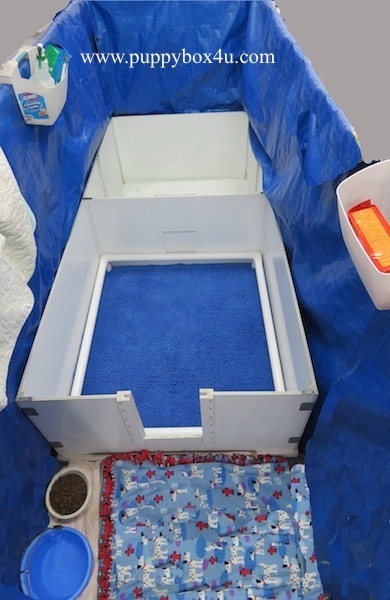 Boxes will still need some absorbent material underneath the vet fleece to soak up fluids. the bottom of the box, as just need the one sheet to absorb up the pee that goes through the Vet Fleece.. 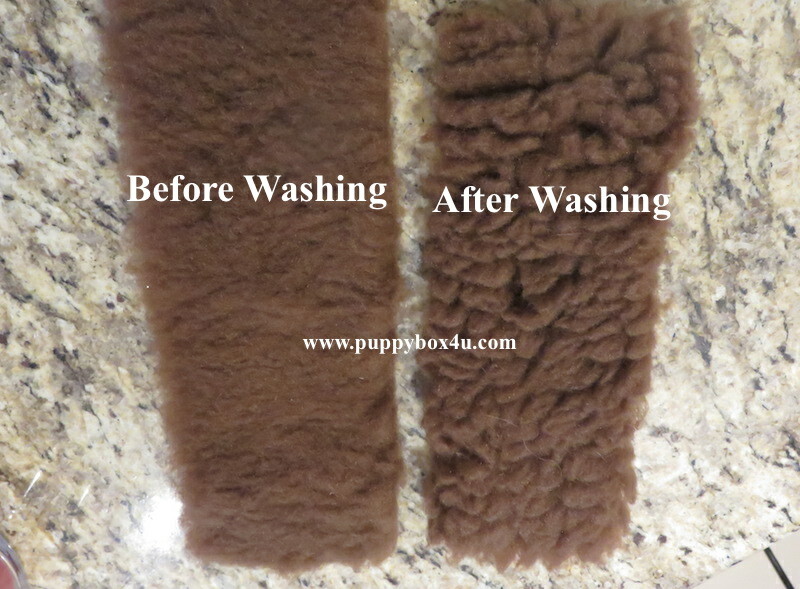 Some people will use their puppy pads under the vet fleece as then they can just wash everything. 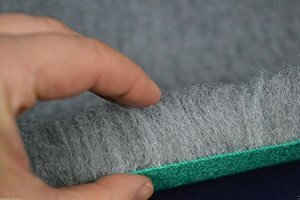 When using the Vet Fleece I have no smell, that is normally found using papers, blankets or other bedding. and had it come up mangy looking, as no one warned me this would happen. You can just brush with a slicker brush to fluff it up, if you want to be bothered. It works perfectly fine, if you don't. I personally don't bother. I just thought I should warn people that this will happen, so they are not shocked. 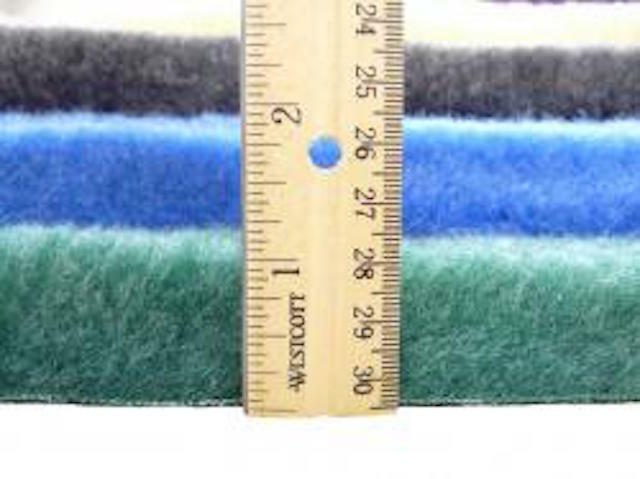 Fleece will not shrink, however cut edges will curl slightly. to encourage the pups to potty on the paper further and further from where they sleep and eat. Any little poops they do on the fleece I move to the paper area. 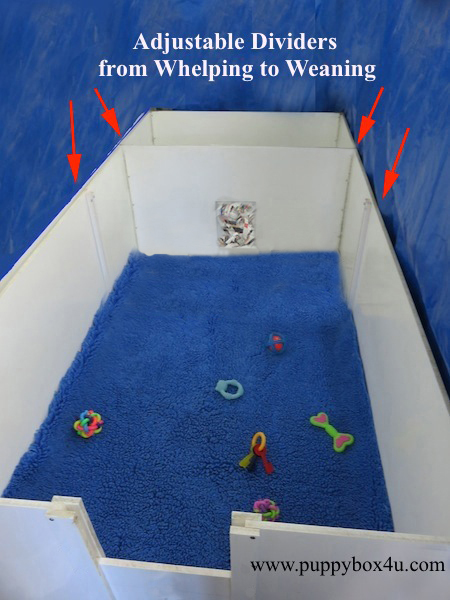 This method encourages puppies to be "clean" by providing a potty area for them to target. and the pups will only poop and 'mostly' pee in the potty area. This means that I Only need to clean the potty area 1-2x a day or as needed, just laying new papers and shredding some. 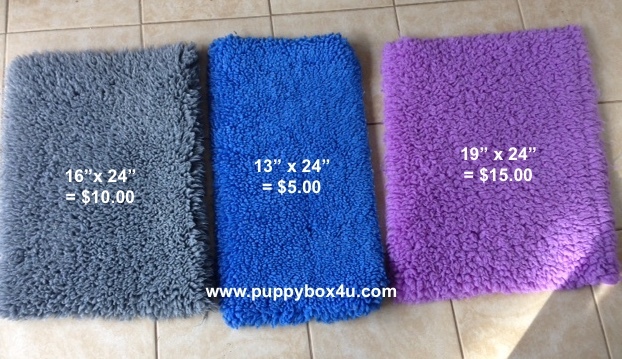 I continue using the 4'x4' piece of vet fleece, because the pups just stay cleaner than without it. and this size of fleece you are able to wash in a washing machine. In this set up, you will use more shredded paper and dry sheathing in the box and have more garbage as a result. and mom is weaned off of them completely by now, as they have sharp teeth. Just to see the difference and obtain different colours. I found grey colour depressing and I prefer the thicker fleece. Get the thicker fleece 1600 - 2000 gsm, though some find the 1450 gsm totally fine. The 1400 or less, moms are able to dig it up and move it around easier. as once you have it you will not wish to use anything else. or security cameras to monitor the pups. any puppy poo stains that momma might have left behind, like the white or beige would. I would advise not getting the rubber backed as after washing turns the rubber "gummy". Buy the proper size to fit in your whelping box. If you get the 60 inch "roll" it is cheaper and you can easy cut to size. but that is all that will happen for the rest of the life of the material. for my puppy cages (put rubber shelving liner under, to hold fleece in place). however some breeders will use it a week between washings. It is heavy to wash, so you may struggle to fit in a washing machine and or dryer, if you get larger than 4'x4' piece. I take mine to the coin laundry which takes 20 minutes. The triple sized machines they have there cost $5.00 and held Three of my fleeces in them. Good news was they were clean in 20 minutes or so and really wrung out well. I then go home and hang to dry, as they don't take long. Come winter I will have to dry them there. Again… well worth it for dry, content, safe pups for 24 hours and a happy mother. 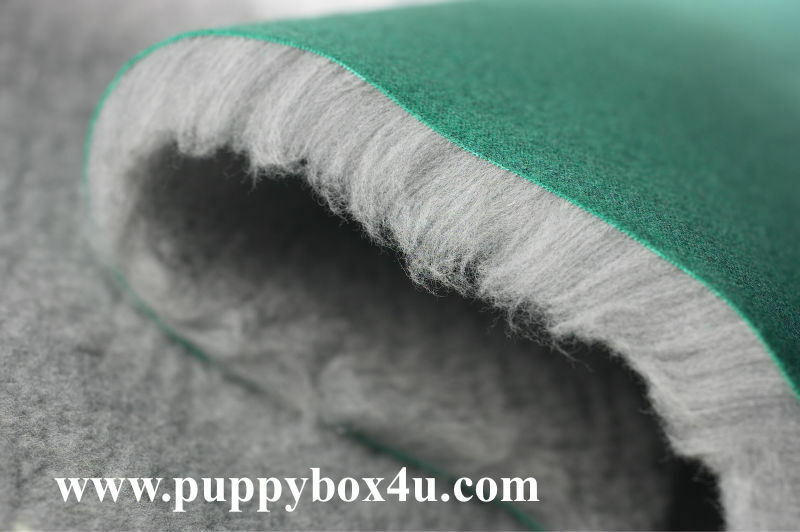 Vet Fleece is made in England and cheaper in the UK just keep in mind shipping, exchange, duties when comparing. 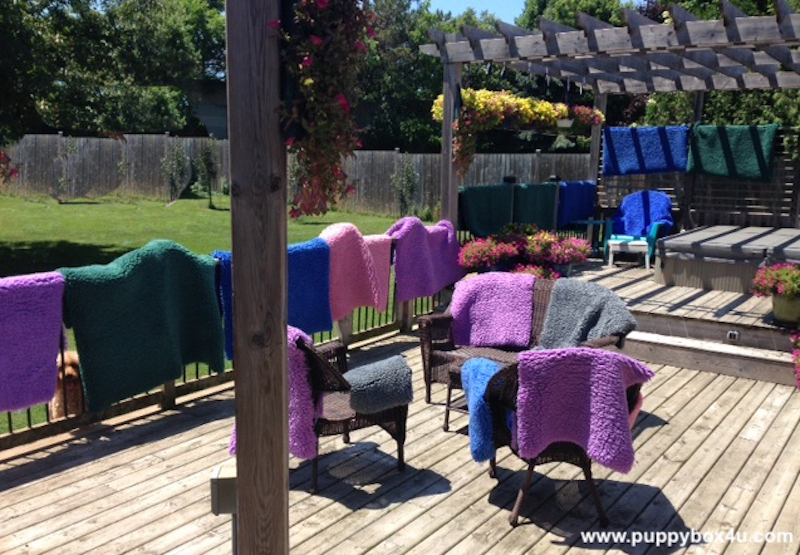 My mother was 100% unable to move the fleece around and pups were safe and comfortable. but Vet bed can be used for Equestrian, baby, nursery, home furnishings and disabled or bed use! invented an imitation sheepskin fleece to protect people from bed sores and nasty infections caused from being bedridden. various brand names like Medi pad, Hospital fleece, Pro pad, Dry bed etc etc. from their operations and so VETERINARY BEDDING was born. It was soon apparent that this amazing stuff was handy for a bit more than just post op care for dogs. The same happened in the dog world with the trade names and suddenly we had.. Pro Fleece, Vet, Bed, Medi bed. Dry Bed.. erm me Bedding Box Vet Fleece. The basic make up of vet bed is a tough latex lined backing and a 1.5 " thick imitation sheepskin top. The idea is any moisture runs straight through the fibres thus keeping the dog, cat, animal, or human, dry and comfortable. An average veterinary bedding should be between 1200 and 1450 GSM. This is a medium - Heavy weight vet bed and the one you are most likely to find on sale. The lightweight one is around 850 - 1100 gsm. its like the fleece you get on a paint roller. due to the thinness of it, it cannot stay dry on the surface as efficiently as the medium weight. The heavy weight is around 1600 gsm and its not often seen on general sale and has to be ordered. WHY? Because the heavy weight doesn't actually do much more than the medium except it will give more support. Its ideal for giant breeds IE Mastiffs, St Bernards, Etc with elbow problems, but other than that the mid range is perfect for every day use. HOW DO I KNOW I AM GETTING A REAL VET BED? Ok first and formost a few old wives tales..
"VET BED is only genuine if it has a green back"
by the sheet for half the price or less than you would pay for the same thing with pet life. now with extra special properties under the new name of "Vet bed gold". but they are still the most expensive on the market. Well the obvious happened and yellow backed vet bed sprung up at the shows. k was the genuine vet bed, and so they were wary of this new yellow backed vet bed. Genuine VET BED is white? WRONG again. Originally you could only get white. Then came grey, then brown. 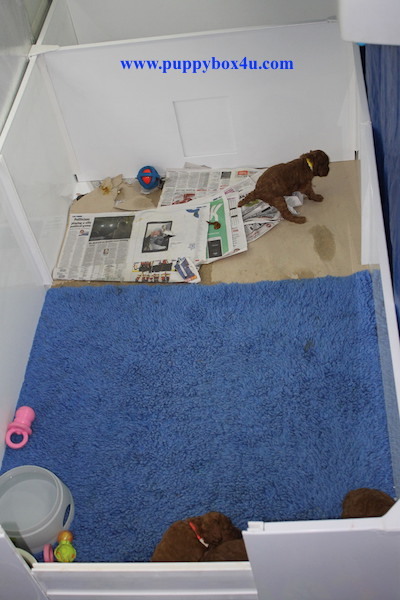 Vet bed was then re branded by another company and blue & green was added. Along came PRO FLEECE and as an independent manufacturer he turned vet bed on its head. mostly for vets, whelping and kittening because of the fact if something is going wrong it shows up. but they do sell vet bed under the PRO FLEECE name. VET BED is made by Pet life so has to be genuine? sold by "pet Life". All veterinary bedding fleeces are made by 1 of 3 factories in the UK. who contact them and are packaged there. These factories also make paint roller fabric, rugs and carpets. who sells vet bed actually MANUFACTURES vet bed! They may put on the packaging "makers of" but they cannot say MANUFACTURERS. Ok, so now thats out of the way how DO you tell a good vet bed. then its paint roller fabric. A good vet bed weighs about 1 kilo. The pile should be over an inch thick and wooly in texture, similar to a sheepskin. If you put your hand palm down flat on it, you should feel a cushioned support and not the flat latex backing underneath. Finally if you put your fingers in it, you should be able to leave "hole prints"
A large sheet of 1.5 mars X 1mtr can just about be folded into 4 but no more than that and even that is a struggle. and guide but here are a few who I have known for many years and can vouch for their service. IN NO PARTICULAR ORDER..
Bronte glen, Dry Bed, Pet life (Original Vet Bed), Pro fleece. Apologies if I missed anyone out and to all you reputable traders, I am happy to add your name to my list here. This is after all a guide to pet owners as to what this stuff is and where to get the real thing. 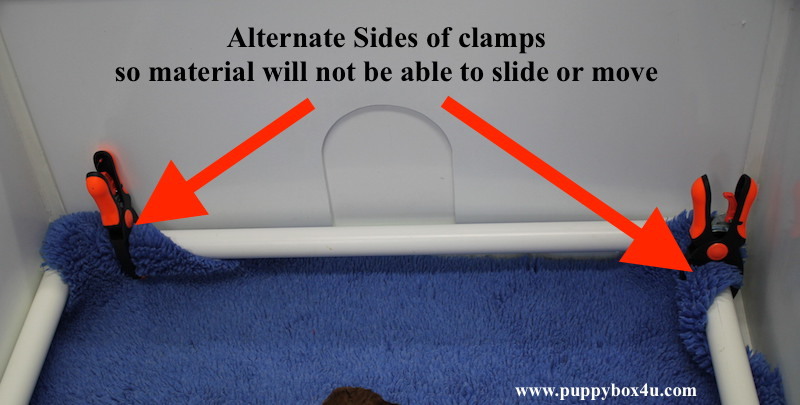 Non slip, plush, and soft vet bed, patterns and pictures! Vet bed as I said comes from factories who make carpets, rugs etc. it was only a matter of time before they made a few variations of their own. and it really is a huge success! It solves the problem we have had for years. "how to stop it sliding around?" The downside is you can only wash it around 40% and not boil it. The backing does wear after a bit, so whilst a green back vet bed will last 20 years + .. HONEST! if that, as it does rub off, or wash off or comes off. I still say go for the rubber back for general pet use. Patterns and pictures are now being introduced. you often see paw prints, bones etc. Due to manufacturing problems this is only available on rubber (non slip) back. and so for pups and whelping purposes aren't suitable. Finally the new kids on the block, the plush and soft vet bed. that didnt break the very fragile hairs of Yorkshire terriers. so a very soft silky fine vet bed was designed. as pug pups can struggle in long wooly vet beds, not to mention over heat. I had a long chat with 2 factories and they made the pink plush vet bed for me, and then the finer soft vet beds. the pile on the soft is the same length but because its fine it doesn't have the support. I repeat THERE IS NO SUPPORT! ... Just checking if you are still awake :). the plush however has the spring you still like from vet bed but without the wooziness. So I hope you find the guide helpful. If you have questions email me. I will try and be as honest and helpful as possible. GET IT FROM ME! I am not the cheapest or most expensive, but I do guarantee the quality. I needed a bed for my own dogs and couldn't find one, so I made one..
to a customer who wanted to check it out before buying. It turned out to be "
Dogs Today" magazine who did a secret survey of all us suppliers. It is used universally in the dog and cat world, veterinary surgeries, rabbits guinea pigs and equestrian because of its unique properties. Dogs which suffer from "pressure sores"
My name is Ros. I breed show and Judge, Samoyeds & Shiba Inu.